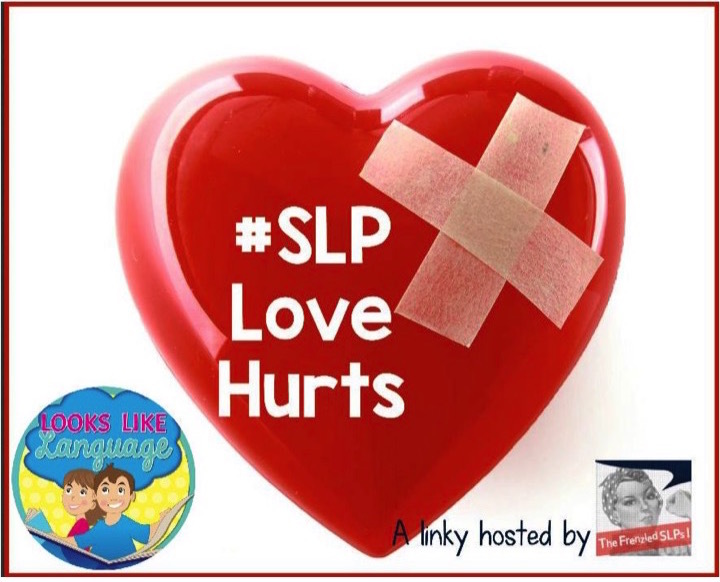 The Frenzied SLPs are sharing their stories about how sometimes love hurts for this Valentine's Day. I'm happy to link up! I still remember the day when I was reassigned to a new school and walked into the classroom to meet my new students. Some were spinning, some were rocking, and some were staring into space. All of them were autistic, non-verbal and had something that I needed to watch out for. I will probably always have that memory. I was in such shock. How was I supposed to teach these children to communicate? Nothing in my experience had prepared me for this! I immediately began learning; from courses, from the internet, and especially from watching the staff in the classroom. Even with the biters, the spitters and the hitters I had for years to come, I luckily only got injured once, by accident. Want to hear my tips? Feel the love in your heart for these children with broken communication systems. They aren’t mean! They just get frustrated and lack the means to express it appropriately. Get to know your students before placing learning pressures on them. Most severely impacted students on the spectrum have sensory issues. Some sensory input makes them happy and others overload them. When students are overloaded and have no way to communicate, “STOP!” their behaviors will be their communication system. Kids on the spectrum are not auditory learners, they are visual learners. Find a way to show the child what your expectations are and what they will get in return. Did you ever wonder where my name came from? This experience cemented my belief in using visual supports. If you are constantly on your toes, you will see the signs of frustration as they begin to occur. Before the child acts out, react to the difficulty the child is experiencing and the agitation on the part of the child. Go back to an easier task. Think about how you can make your expectations more visual before you try that activity again. Have lot of activities prepared. After a few trials of something that is hard to do, do some easy/fun/ review trials. So, the time I actually got hurt? I was covering a class of children who I didn't know at all. I sat behind the chair of a little guy who was getting antsy and put my hands on the chair so it wouldn't tip over and get him hurt, when he suddenly jumped up and hit my chin with his head! It is ironic that after all of the hours of the close contact that occurs during our speech/language sessions, narrowly avoided injuries, watching out for my biters and suffering through getting spit at, my first real injury was by accident! Of course, no matter how much we learn, how hard we work, or how hard we try, we may end up getting in harm’s way at some time or another. But, we still come back, seeing the positive qualities of the child in addition to the difficulties. SLPs are dedicated to helping their students improve their communication skills! For more stories of how love hurts, go visit the rest of The Frenzied SLPS!